Panthers captain Ed Jovanovski logged almost 16 minutes of ice time in his return to the ice nine months after hip surgery. 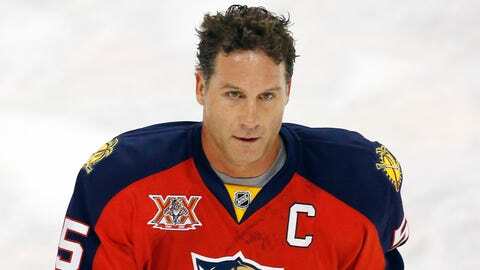 SUNRISE, Fla. — Doctors and athletes may one day remember Ed Jovanovski as a pioneer. Nine months after undergoing major hip surgery, the Florida Panthers captain returned to the ice. It wasn’t a one-shift-and-done moment, either. The defenseman logged just under 16 minutes of ice time, filled roles on the power play and penalty kill and finished with a plus-3 rating in Florida’s 5-4 shootout over the Nashville Predators. "The legs felt a little heavy, something I probably I expected," Jovanovski said. "It makes the body feel all that much better when you do win." Jovanovski’s return became official at 1:22 of the first period. With fans at the BB&T Center cheering his first shift, he gathered the puck at the goal line and connected on a pass with Tomas Kopecky in stride across the far blue line. "I got a little antsy there jumping around during warmup," Jovanovski said. "The first shift, it was nice to get it out of the way, move the puck and have a decent first shift and carry on from there." On Friday, Panthers coach Peter Horachek thought the veteran might play 5-6 minutes. During Saturday’s morning skate, the estimate grew to a range of 12-13 minutes. Jovanovski exceeded both. He was pressed into action when defensive pair Alex Petrovic left with an injury early in the third period. But for Jovanovski to come back from a procedure no professional athlete is believed to have overcome? Give thanks to modern medicine and mental fortitude. "For me, yeah, this is something I’ve dreamed of since I had the surgery, the opportunity to come back," Jovanovski said. "I didn’t want to make a big deal out of it. It’s something I kind of kept hush-hush for a long time. My goal from the get-go was to come out and play." Tomas Kopecky scores in the sixth round of the shootout as the Panthers edge the Predators at home. Plagued by hip pain which emerged during the 2011-12 season and cut short his lockout-shortened campaign in 2013, Jovanovski opted to have his hip resurfaced after numerous therapeutic options failed. The procedure Jovanovski underwent is essentially one step away from a hip replacement. For a player with 17 seasons, five all-star appearances and an Olympic medal to his credit, many might have expected a retirement announcement. Jovanovski’s love of the game only fueled thoughts of a return. "I enjoy coming to the rink. I enjoy the competitive side of it. I enjoy the guys," Jovanovski said. "I think when you get to the latter part of your career, you start thinking of those moments. I’m not ready [to retire]. I love those moments." All too many athletes have been robbed of those snapshots, careers cut short by injury. Would defenseman Bobby Orr have transformed the game even more had it not been for close to 20 knee surgeries? How many additional goals would sniper Mike Bossy have scored if doctors could correct endless back problems? Would we still be witnessing highlight-reel efforts of playmaker Peter Forsberg had surgeons been able to repair chronic ankle problems? How much longer would Panthers general manager Dale Tallon have continued to simply play? It is easy to understand why Tallon exhibited a father-like pride when he announced Friday the Panthers’ captain would return — Tallon has been on the other side of the situation. In a contest against the Vancouver Canucks, the then-Pittsburgh Penguins defenseman lost the edge of his skate and crashed into the net. He was taken off the ice on a stretcher with a compound fracture of the tibia. Doctors in those days chose to reset the leg manually instead of surgically. Tallon’s leg never healed properly. March 14, 1979 marked the end of his playing career. "To be 29 and told your career is over …," Tallon said. Tallon said he has since endured 10 surgeries as a result of the injury. Consider Tampa Bay’s Steven Stamkos, who suffered an injury almost identical to Tallon’s on Nov. 11. The Bolts center underwent surgery two days later to reset the leg. Today, Stamkos is skating in full gear and expected to return to the ice — with no ill effects — in February. "I remember having that conversation with [Tallon], with the medicine it is nowadays, how it is, everything is kind of evolved into something great," Jovanovski said. "I think in every sort of area — you’ve got knee, you’ve got hip, you’ve got shoulder — there are ways to make you feel better again. Back when Dale was playing, at 29, however many years ago that was, obviously it hadn’t caught up." Even with advances over the last five, 10 years, there are no guarantees through modern medicine alone. At least two former NHL players are known to have had a hip resurfacing and neither returned. Tim Taylor underwent the procedure in 2007 to correct a hereditary defect. He rehabbed with the intent of returning to the ice, but never did. Former Florida Panther Mike Sillinger also had the surgery in February 2009. The center missed the remainder of the 2008-09 season and retired that August. Jovanovski spoke frequently with Sillinger about his experience with the procedure. The long conversations impacted the former first overall pick’s decision in attempting a comeback. "There were good ones, positive ones, him telling me that he plays in a beer league," Jovanovski said. "Obviously it’s not as physical as the NHL is. But he said in fairness to that, he never trained to come back. He feels great and he feels, yeah, there’s a possibility he could have done it." With faith in his doctors, it was Jovanovski who had to shoulder the mental weight, finding strength to overcome occasional lows and believe an NHL comeback would come to fruition. "It’s a daily grind. As for the mental side, having that confidence knowing the work you put into it is strong," Jovanovski said. "I don’t have a crystal ball. I don’t know how everything is going to unfold. But if I remain positive and kind of do all the work I need to do, I think that will give me the best opportunity." Whether from former coach Kevin Dineen, Horachek, Tallon, even new owner Vinnie Viola, there has been a consistent message sent to Panthers players this season: There are no entitlements. There are no guarantees. Nothing can be accomplished without hard work and support of teammates. But the simple act of the team captain stepping onto the ice after nine months of grueling rehabilitation, accomplishing something once unheard of underscores it all. "I think if you set your mind on something you want to do, you’re going to find a way to achieve that goal," Jovanovski said. "No one can answer that question for you except yourself. I think that is the message — you want to be your best now." With their captain back, that’s exactly what the Panthers are aiming for. You can follow Erin Brown on Twitter @rinkside or email her at erinbrownfla@gmail.com.